They are fabricated from welded or woven wire mesh decks that are attached to a series of vertical metal rails. Besides a professional appearance, these storage rack systems have many benefits for the home, office, store, workshop and manufacturing facility. Wire Storage Racks – Ridg-U-Rak, Inc.
Wire storage racks are commonly used in shipping centers and storage warehouses in all manufacturing industries. Restaurants and medical facilities like hospitals and doctor offices also use these metal storage racks for equipment storage. While they can be made of any metal, stainless steel is the most common because of its durability, resistance to temperatures and ability to deter oxidization which leads to rusting. Steel storage racks are easy to clean and sanitize, can handle wash downs, and exhibit a smooth, shiny surface. Stainless steel is also fire and heat resistant, which increases work safety in facilities with combustibles for flammable materials. Wire racks are porous as they are manufactured in a grid pattern and therefore offer high visibility and because the deck isn’t a solid surface, it prevents any dust buildup. It also offers product ventilation if needed. As an alternative to decks made of wood, particle board, sheet metal or plastic, wire mesh is cost effective and durable. Every storage rack is fabricated with different specifications, including height, width, depth, weight capacity, material and finish. Storage racks made of metal wire are assembled on site. They are either set against a wall or organized in rows with separating aisles. Some are mobile and are equipped with a set of 2-6 casters or pneumatic wheels that allow easy material transportation. These racks are moved by manual pushing, but require little energy to maneuver. For warehouse racking, wire storage racks are also attached to a track system and therefore cannot move easily once assembled and positioned. The wire decks are fabricated from a series of metal wires that are either woven and interlaced together, or assembled perpendicular to each other and welded at the cross points. Those that handle heavy loads are often made with steel rod reinforcements. Most wire shelving is galvanized, painted or coated in rubber or epoxy, or plated with chrome to prevent rusting, increase heat resistance and increase lifespan. They are able to hold many different kinds of loads, but are best suited for those with flat bottoms like boxes or trays. 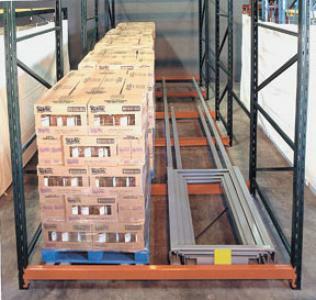 Some wire storage racks are adjustable to accommodate differently sized items. Wire Storage Racks Wire storage racks are shelving systems used for storage, display or organizing products, equipment or material.